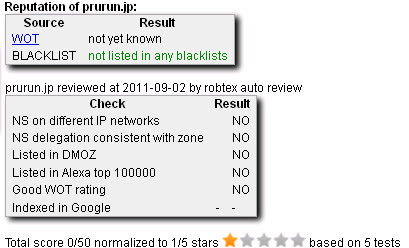 The above domains are top list of japanese spam mails source in Aug 2011. Can't easily blocked by FQDN or MX check since the domains was registered properly with a good reputation. Those domains are alive now and agressively sending spams to mobile and PC mail rapidly, and ONLY in Japanese format. Japanese spams is working in the different scheme compare to the worldwide malvertising/spambot scheme, I hope the below explanation will make you understand about what happen locally here. 2) How these spams can get through the FQDN/Reputation filtering systems? The domain is maintaining the reputation, spammers keep on registering new domain and keep on maintaining new domain in daily to weekly basis. By having the good reputation (i.e. new domain) they can spam much in a shot, and that's the target. If the repoutation got corrupted the domain will be switched into new one in no time. It is indeed a clever scheme which cost effort and expertise from spammer side in Japan. The real problem of these spam scheme is, 1) they are using the user's mail address database which is exchanged in the black market in Japan. 2) Why bother to buy the mail address database? Because for each mail which clicked by the user the point goes to the spammer which can be exchanged with money in the real life.., yep, money boost the this scams, which not a crime act yet. I've seen the similar pattern of this info for 3years now, yet there is nothing that we can do from the networking side to battle this further..
One thing is for sure, we need the law base act for spams too for sure. 4) What is the moral of this story? *) To fight spams, you need to kill the cycle which boost it. Stop its money flow!